Shape The Holiday Your Way! 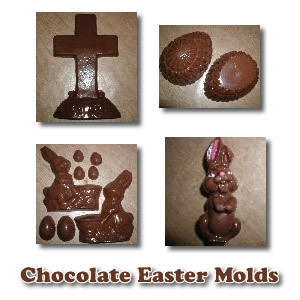 Chocolate Easter Candy Molds are such a great way to prepare special holiday chocolates for your family and friends. Whether you want to go with something silly and fun, like bunnies and chickens, or a bit more serious like a cross or a lily, you will find something just right for you at Candyland Crafts. They carry over 2000 different molds for every occasion imaginable and they are my number ONE go to place for buying chocolate candy molds. Browse their selection for clever ideas. You can even mold a chocolate house and decorate it with the kids. It's great fun! Candyland Crafts is one of those suppliers who has just about everything you could possibly need for making fantastic homemade candy for any special occasion. You can get the molds, the chocolate, colored candy melts, cellophane bags, and much more. Once you have selected your Easter candy molds, chocolate, and other supplies, you are ready to begin. Here are some step-by-step guidelines for making your own chocolate molded candy. You can melt the chocolate in a double boiler over hot, not boiling, water. Stir until fully melted and smooth. You could also choose to melt the chocolate in the microwave. Only heat the chocolate for 30 seconds at a time, and stir well between each heating. Be careful not to overheat. Pour melted chocolate into your Easter candy molds. Depending on your mold choices, you can simply fill the molds with the melted chocolate and allow it to set, or chill to help the process along quicker. If you decide to make hollow chocolates, you will need to either "paint" the chocolate in with a small brush, or fill the molds and after setting a few minutes, tip upside down to drain out the excess in the center. Also, you can use colored candy melts to paint the details in the mold before filling with the chosen chocolate. If you choose to go that route, be sure to let the colored chocolate set each time before adding additional layers. All of this fiddly work takes time, but you will really love the results. Remove candy from molds and wrap. Check the bottom of your clear molds to see if the chocolate has pulled away. You may have to chill them a bit longer if they aren't releasing easily. Another trick is just to simply tap them gently on the counter top to jiggle them loose. After tipping the chocolates out, you can place them in cellophane bags with little twist ties or ribbon for decoration. If you have chosen molds that need to be paired, like two halves of an Easter egg, simply melt a little more chocolate and paint the seems with the melted chocolate holding the two pieces in place to allow them to adhere. The wonderful thing about Easter candy molds is that you can make them as simple or as complex as you like. You can go with a plain solid chocolate mold, or get creative with colors, sprinkles, frosting, fillings, etc. You can even make chocolate molded lollipops. It's all up to you and how much time and effort you want to invest in your Easter candy molds. Another great thing is that they are inexpensive and fun. I hope you enjoy the experience to the fullest!